The new Tunze DOC Master skimmer models 9620/9640 offer improved ergonomics and efficiency. This new protein skimmer from Tunze, is an evolution over the traditional external skimmer designs, commonly used in reef aquariums. The Tunze Master DOC 9620 and 9640 protein skimmers are intended for use in applications where a high bioload is present, or where SPS is demanding of pristine water conditions. 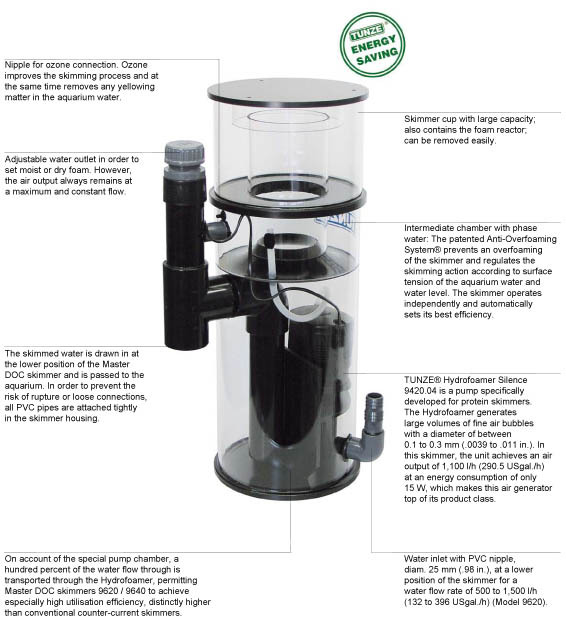 Simple installation, low-noise operation, a large skimmer cup, easy ozone integration, and a patented Anti-Overfoaming system are just a few of the features of this new protein skimmer from Tunze.